This fundraiser is on behalf of Ms. Manjula, she is 44 years old widow and living on her own. She works part-time as house-help to earn her living. Her two sons are currently unemployed, hence she is the sole-provider of the family. Her 72 year old mother, Mrs. Malligamma G, met with a car accident on 24 Feb '18. It was a hit and run case where she sustained injuries to the hip, face, shoulder and head. The diagnosis confirmed that she suffered poly-trauma and required surgeries for injuries on clavicle and pubic bone. 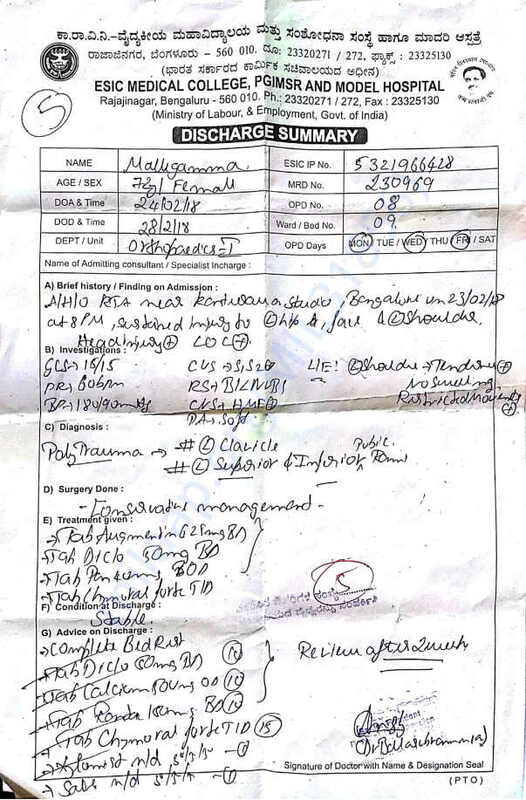 Maligamma was first hospitalised at ESIC government medical college, however she was discharged within four days (refer to ESIC - Discharge Summary for details) after conservative management (it is an approach to treating back pain, neck pain and related spinal conditions utilizing non-surgical treatment options, such as physical therapy, medication and injections). 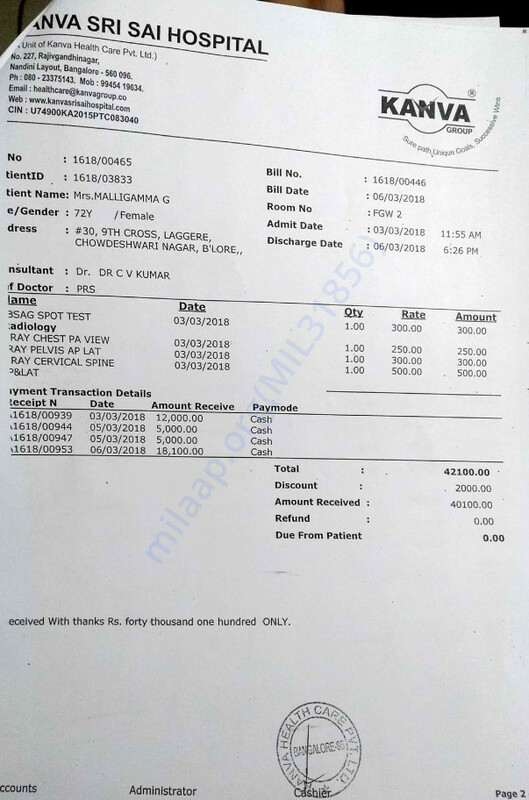 She was then moved to Kanva Sri Sai Private Hospital on 3rd March, where she underwent pubic area surgery, which was paid for by Ms. Manjula. 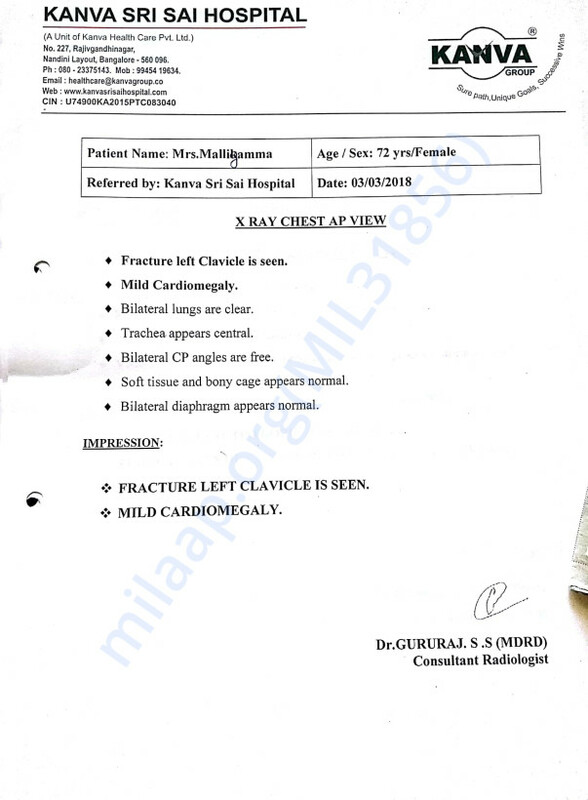 Clavicle surgery and post-operative care are still pending and require money. 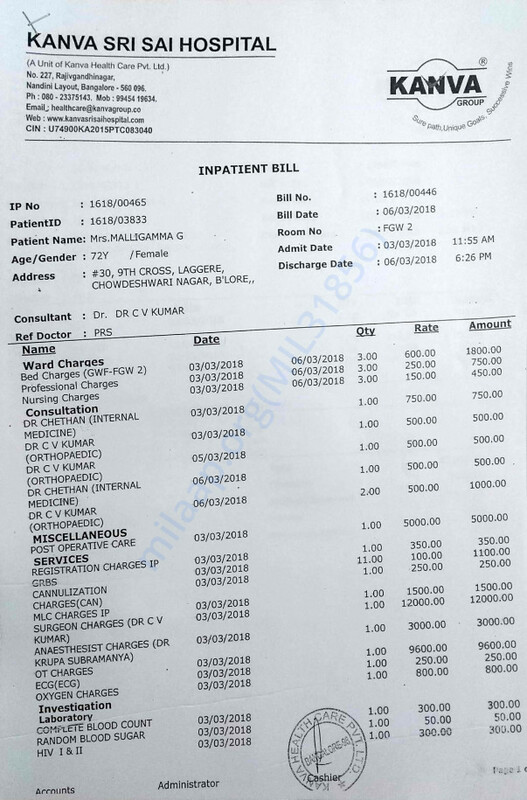 The entire procedure and medical bills amount to Rs. 1.5 lakh, Ms. Manjula has been able to pay some portion through borrowing and savings, however she still requires Rs. 1.1 Lakh urgently. 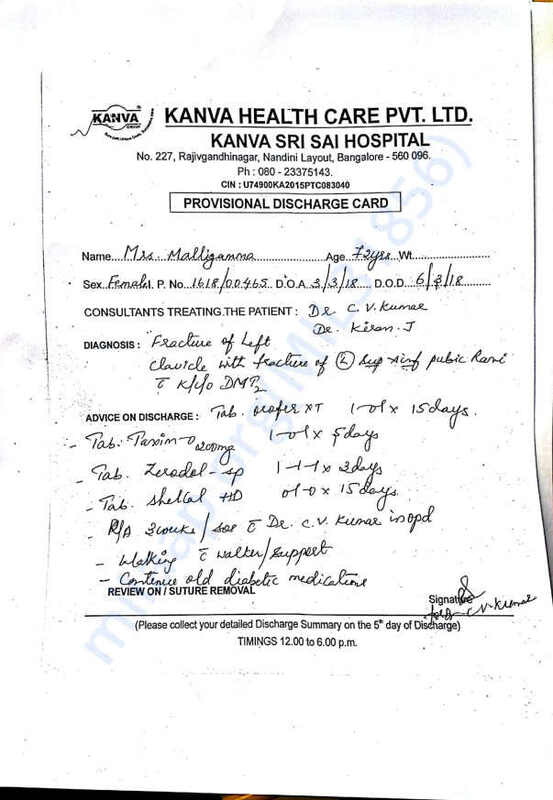 Mrs Malligamma is currently stable but due to her old age, recovering slowly from the pelvic surgery. 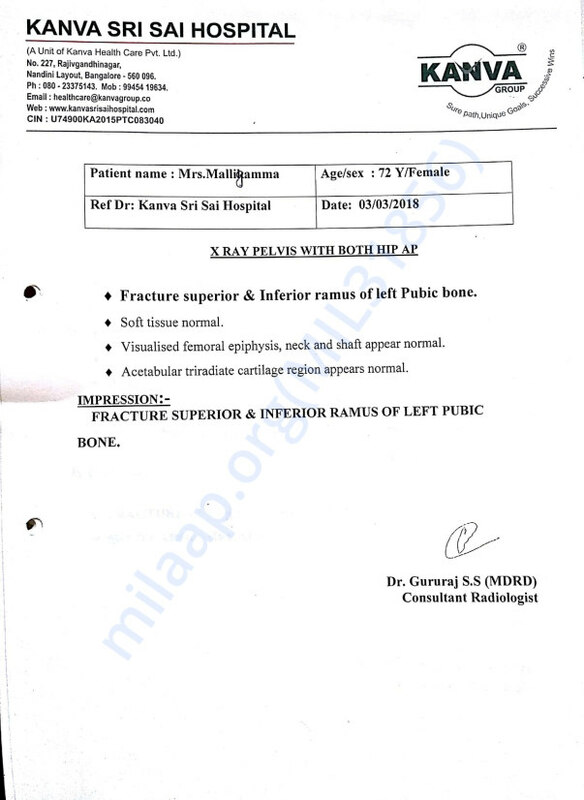 A bone in the pelvic area had suffered further damage hence doctor has suggested bedrest and medicines. She is going for a CT scan scheduled on Monday. A second surgery on the pelvic area will be decided after that. Once that is done, they will move on to the clavicle surgery based on her health status. She is currently on painkillers and diabetes meds, and following a diet of roti, ragi ball, mostly. Thank you for the love and support. We are grateful to all of you. 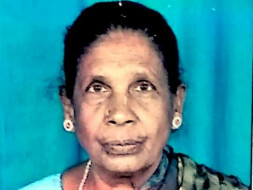 Mrs Malligamma is currently going for regular monthly checkups with doctor. Latest checkup with doctor confirms an infection due to the rods. The rods from the pelvic surgery have been removed, dressings on the pelvic area continue on alternate days by a relative who is also a nurse. The doctor has said it will take about 6 months for the infection to heal (due to her age). She is continuing on her pain and diabetes-control medication. She manages to move around the house with support from somebody. 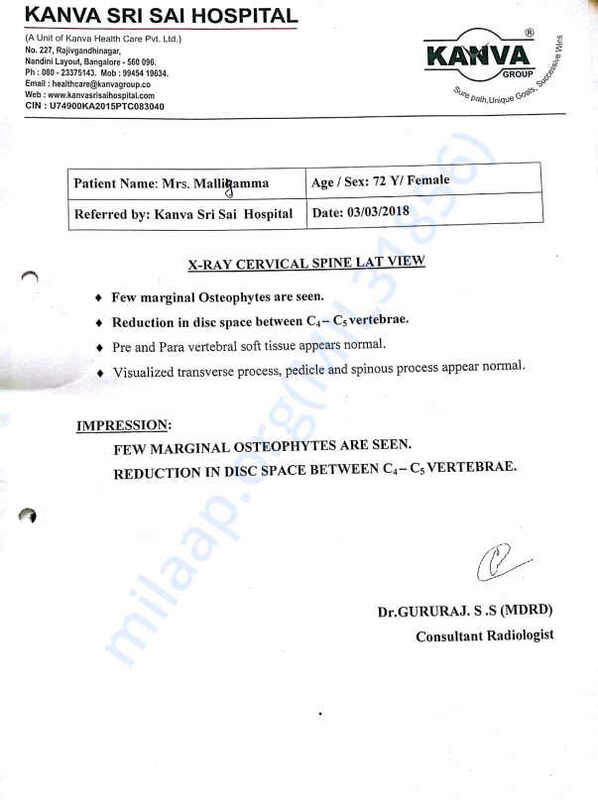 Mrs Malligamma is currently recovering from the first pelvic surgery. Post the surgery, there were rods put on the pelvis for reconstruction. But the rods caused infection because of which her next operation has been put off for a month. The treatment for her infection is on now, which includes fresh dressing alternate days and a weekly checkup. The treatment is going well. She is currently on medication to subside her pain and also control her diabetes. 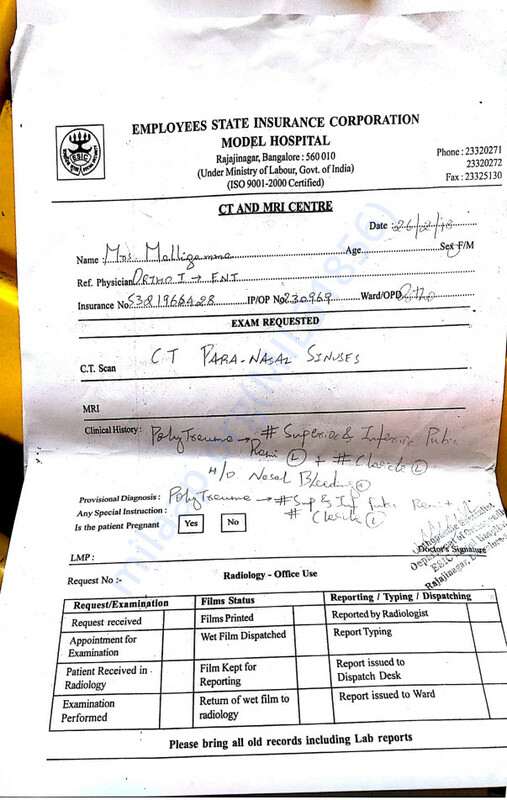 As per the doctor's suggestion, she will be undergoing the second surgery, once her physical condition is more stable. The tentative time the doctor has given is about a month's time. She will be operated on her clavicle area. We shall be withdrawing funds for the her second surgery and paying pending bills.